SHANGHAI, April 11, 2019 /PRNewswire/ — I-Mab Biopharma (“I-Mab”), a clinical stage biopharmaceutical company exclusively focused on the development of potential first-in-class and best-in-class biologics in immuno-oncology and autoimmune diseases enters into a collaboration with Roche for I-Mab’s clinical study to evaluate TJD5 in combination with atezolizumab (TECENTRIQ®). TJD5 is a differentiated monoclonal antibody against another promising immuno-oncology target, CD73. It is expected to stimulate the immuno-suppressive tumor micro-environment and to work in concert with other cancer therapies such as PD-1 and PD-L1 antibodies. TJD5 acts through a unique intra-dimerization mechanism for anti-cancer activities and inhibit the target enzyme activity completely. This unique mechanism of action ensures the molecule to work normally without a “hook effect” as evident in our preclinical studies. 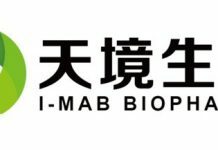 I-Mab is a dynamic and fast-growing China-based global player exclusively focused on developing potential first-in-class and/or best-in-class biologics in the areas of immuno-oncology and autoimmune diseases through internal R&D capabilities and global partnerships. I-Mab’s pipeline is driven by the company’s development strategy to address unmet needs in China and to bring innovative assets to the world. The company is prepared to submit additional INDs in order to initiate clinical trials in China and the U.S., including multiple Phase 2 and Phase 3 studies. I-Mab is on a fast track toward becoming an end-to-end fully integrated biopharma company. The company has been well-recognized by capital markets by successfully raising approximately USD 370 million within 12 months, with its USD 220 million Series C financing in July, 2018, representing one of the largest amounts ever raised by an innovative biotech company in China.